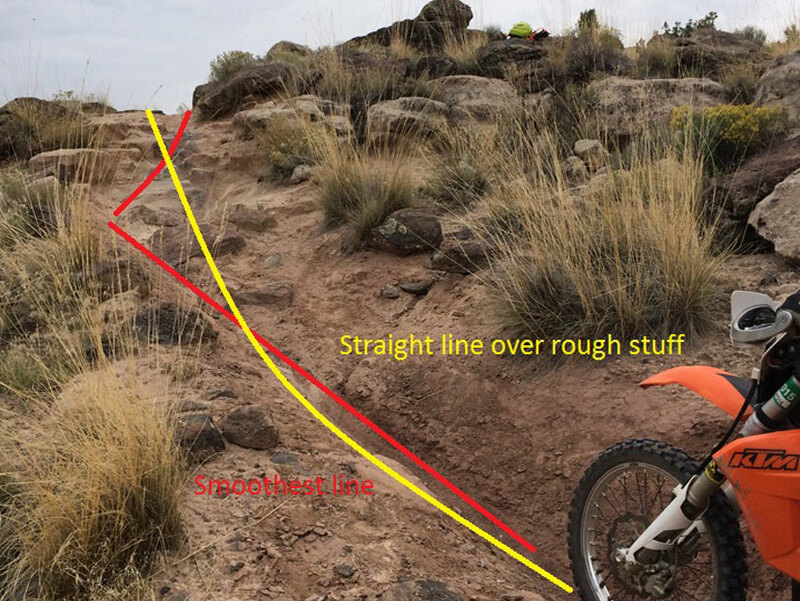 Line Choice is Critical to Off Road Riding! One of the most important skills all riders must develop is “line choice.” For the sake of this conversation, I will define “line choice” as the path you choose to ride your motorcycle. When riding off road, line choice is critical! Proper lines are the safest, most controlled means through a section of trail. I follow several rules of thumb. My first choice of lines is always the smoothest line. The smoothest line is often the fastest line but more importantly the safest line. In smooth conditions, tires maintain contact with the ground resulting in better control. If I cannot find a smooth line, my second choice is a straight line. 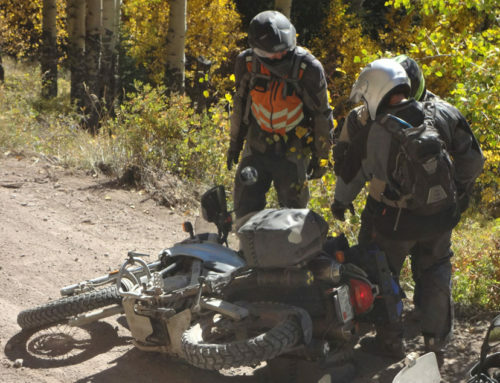 Motorcycles are typically most stable when the tires are perpendicular to the ground. If the ground surface is rough the job of suspension is to maintain tire contact with the ground. Taking a straight line through “rough sections” maintains perpendicular tire contact with the ground. If the line is smooth and straight, that’s the safest, fastest line. Which brings up an interesting point, sometimes the smoothest, straightest line means jumping over or skimming a rough section! 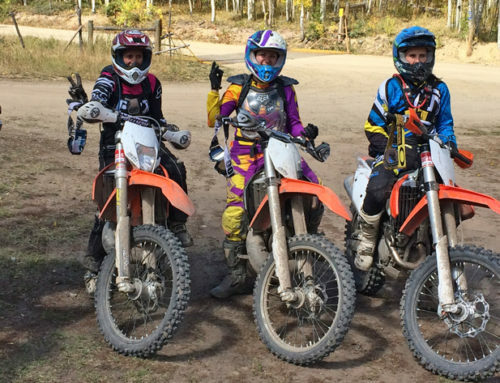 Off road riders develop skills specifically designed to lift the motorcycle up and over obstacles. Golden Spike trail in Moab is infamous for “Golden Crack,” an intimidating gap that is actually fairly easy to jump! Trail conditions will also affect line choice. In wet slippery conditions, sometimes a rut or wheel track is a great choice because it keeps our wheels from sliding around. In wet conditions, sometimes I look for embedded gravel and rock which can give better traction than greasy, slick clay. That’s how I navigated Corkscrew Pass in the rain! Slippery conditions require good line choice, and subtle throttle and clutch control to maximize traction and minimize spin. Finding a good line through rocky and gravel hills can be a real challenge! Larger embedded rocks can be easier than smaller loose rocks. Often I find myself “piecing together” bad sections with good sections, letting the bike “roll” through the bad sections and brake checking (downhill) and accelerating (uphill) on the smoother good sections. There’s a loose, rocky hill section in the White Sand area near Moab that has no good lines! I look at the top of the hill, try to keep the bike in a straight line and maintain flexibility and balance for which ever direction the bike may get pushed. Another important consideration in line choice, is camber. For our purposes, “no camber” is a flat surface. “Off camber” refers to ground that slopes away from the direction you are riding. 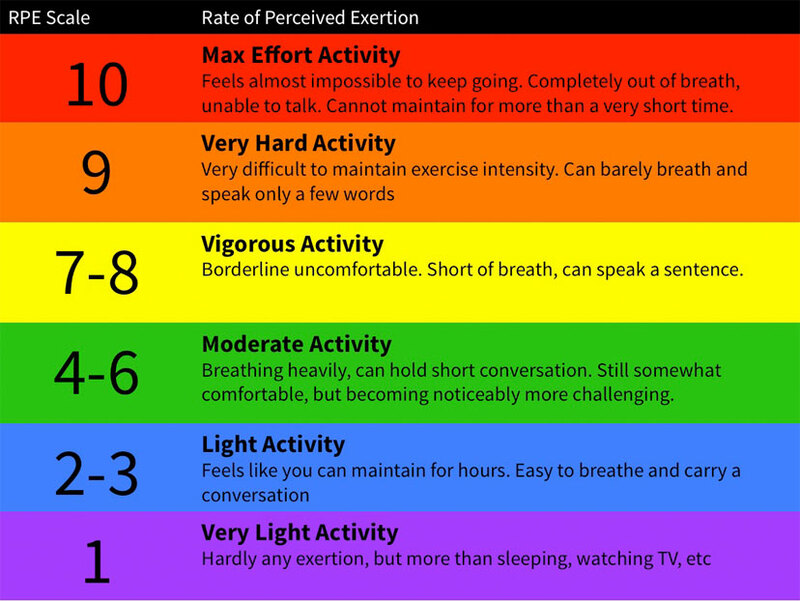 For example, imagine riding a trail where uphill is to your left and downhill is to your right. It’s possible the trail will slope downward to the right. If you attempt to turn left by leaning to the left, the downhill or off camber slope of the ground might cause your wheels to loose traction and slide out. 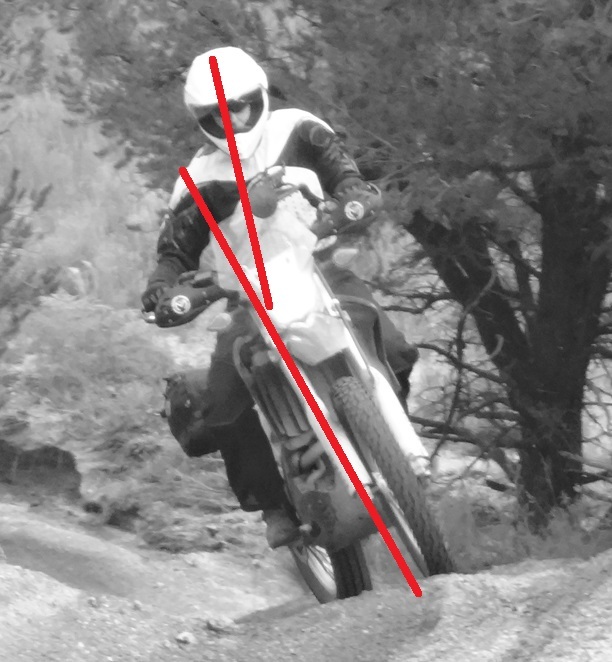 Conversely, if you’re turning to the left and there is a berm on the right, riding that berm can create a much more stable line. “Railing a berm” is a fast and fun turning technique! 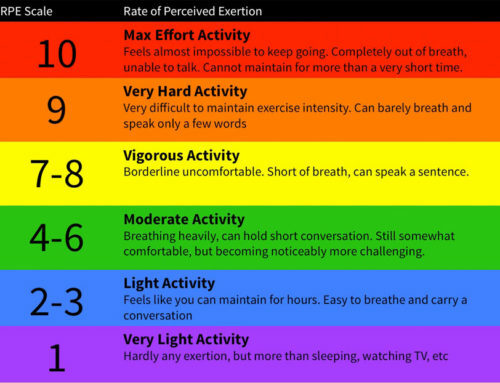 Situational awareness is key. Water travels the path of least resistance and can create ruts and loose rocks. When riding two track trails, I’m always aware if there is a “downhill” track and uphill track. Downhill tracks often will have loose rock and debris caused by water runoff. Murky mud puddles on double track can be hard to guess. I typically take the uphill track since the rut in the downhill track usually holds water longer and is deeper and more eroded. There are no guarantees, but these kinds of things can help when choosing your best line. Good line choice takes lots of practice. It involves a lot of “trial and error.” Choosing a “bad” line isn’t the end of the world. But repeatedly choosing the wrong line will tire a rider out and increase the risk of crashing. 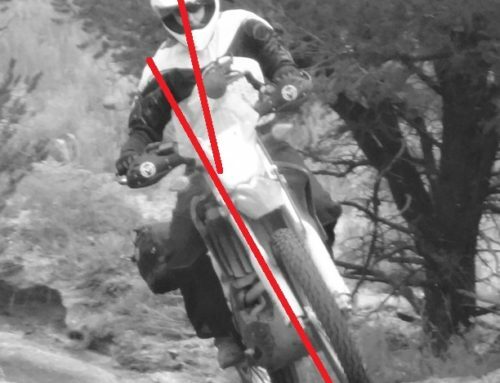 Quickly reading terrain and making split second line choice decisions is a key skill for off road and dual sport motorcycling! 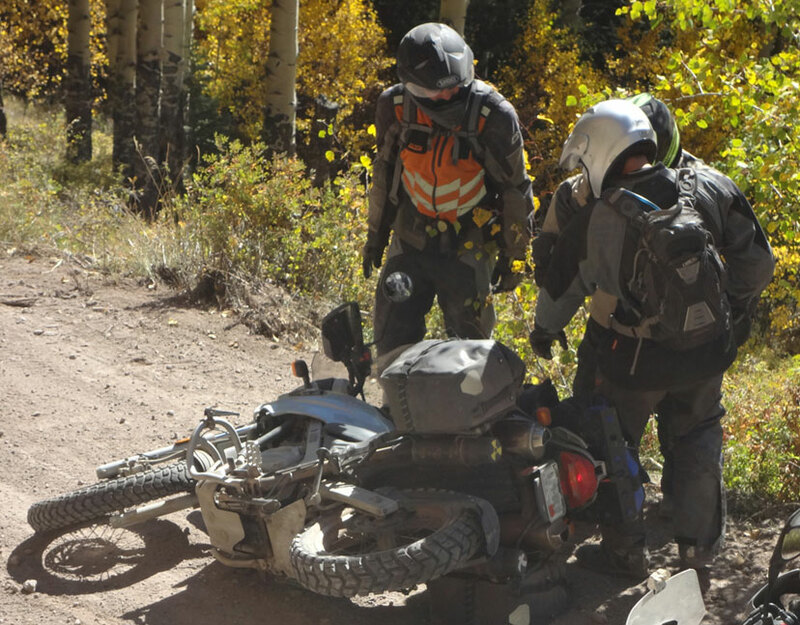 By Pat Jacques| 2016-11-28T11:07:56+00:00	October 31st, 2015|Uncategorized|Comments Off on Line Choice is Critical to Off Road Riding! 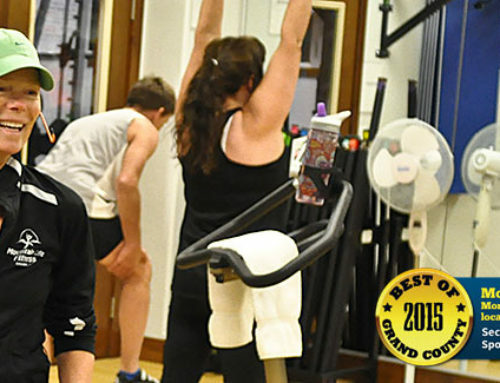 Better Fitness Equals Better Rider! Man Up! Ride Like a Girl! Help! I’ve fallen and I can’t pick up my bike!